Opis: Are Martians trying to tell us something? 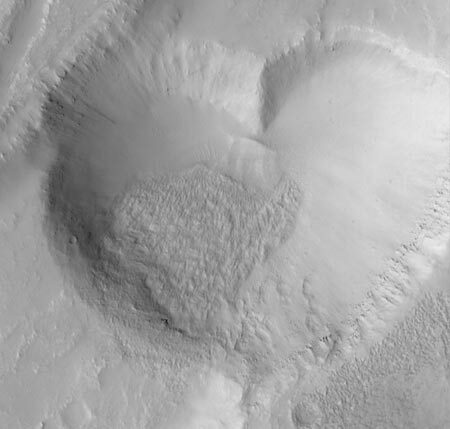 An indentation has been recently photographed on Mars that resembles a heart, a common human symbol for love. Because intelligent Martians have never been known to exist, and because formations with similarities have been found that clearly result from natural phenomena, the pit shown above is thought not to be a form of interplanetary communication. Many scientists believe instead that the right-most wall of the two-kilometer wide heart-shaped pit was created by a naturally occurring graben, a surface drop caused by expansion along a fault-line. Perhaps love is easier to find here on Earth.